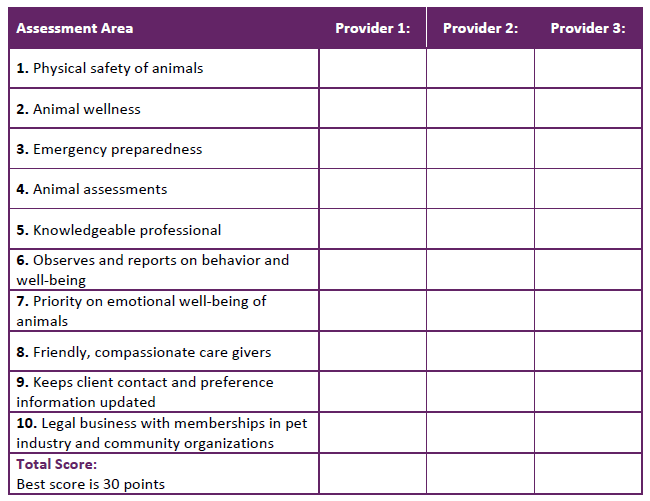 Compare your top three professional animal care providers using our selection checklist. Review the tips on what to look for in each assessment area as you interview and visit your professional care options. Enter a number for how well each provider met your expectations in the ten assessment areas listed. 2. Animal wellness – Vaccination records obtained for all animals and physical exams performed prior to lodging stays. Communicates openly when common communicable diseases, like canine cough, are observed in your community. 3. Emergency preparedness – Procedures and systems in place to handle animal illness, injury or escape in addition to natural disasters and utility outages. Trained in animal first aid. When care is provided in a center or home environment, there are 24-hour staffing and/or monitoring systems. 4. Animal assessments – Profiles your animal’s behavior and preferences prior to accepting them for care. Recognizes each animal as an individual and offers a variety of service options versus a one-size-fits-all approach. Priority is ensuring a good match in care and offers a thorough tour of their pet center or an orientation visit for home care. 5. Knowledgeable professional – Trained in animal behavior including body language and stress signals that provide early warning of discomfort or illness. Participates in continuing education to stay up-to-date with animal care trends. 6. Closely monitors animal health – During lodging or home visits monitors how each animal eats and whether their eliminations are normal. Knows when to escalate abnormal behavior to veterinarian care. Openly communicates behavior and health observations with clients. 7. Priority on emotional well-being – Professionals recognize the importance of animal happiness and only use tools that reward good behavior and avoid punishment. They also offer a variety of activities to appeal to differing animal activity levels and ages. 8. Friendly, compassionate care givers – They are patient in answering questions and spend time understanding the needs of your animal. They are nice, communicate proactively and look forward to working with you and your animal. 9. Keeps client contact and preference information updated – Requests multiple methods of contact for you and an emergency contact in the event you cannot be reached. Asks your preferences for notifications when traveling or in the unlikely event of an emergency. 10. Legal business with memberships in pet industry and community organizations – Professionals operate a legal business and are insured or bonded. 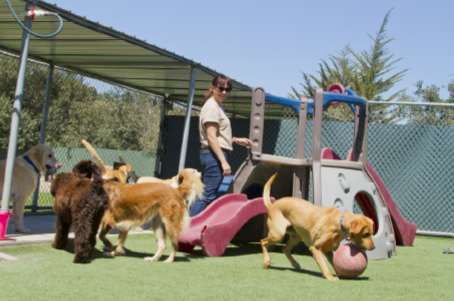 They are active in professional pet industry and community organizations.